Today, Mr Juha Marttila, president of the MTK (the Finnish Central Union of Agricultural Producers and Forest Owners), finalised the membership agreement between the MTK and the think tank FARM EUROPE, in Brussels. 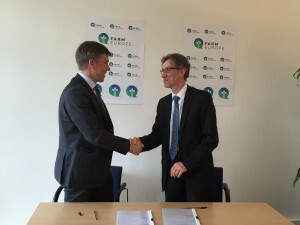 Farm Europe is committed to developing thinking on efficient ways to activate policy levers at EU level to increase both the competitiveness and the sustainability of the EU farming and food sectors and to step into the debate with concrete proposals. The think tank focuses on all policy areas that impact on rural business with a strong emphasis on agriculture and food policies, particularly the Common Agricultural Policy (CAP), but also food standards, the food chain, environment, energy and trade issues.